There are five different shades in the Camouflage Cream Palette. I went for the #1 palette as it's the lightest and targeted at 'European Skin'. The two shades that I was most impressed with were the lightest skin shade as it's perfect for brightening under eyes and the green shade at the other end which is designed to combat redness. 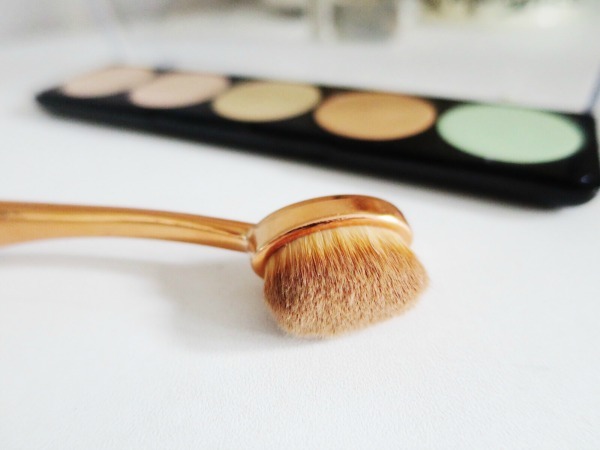 I found that the green concealer worked really well and did well neutralising my skin tone. The price of the palette is £27.00 which works out at just over £5.00 for each concealer. I don't know if it's totally worth that much money but for the range of shades and the correcting colour too, it's definitely a good investment for an all-in-one concealer palette. Have you tried anything from Make Up For Ever? I agree the range of shades seems to be really good! I've never tried any color concealer products, just because I love to keep everything as simple as possible makeup wise. Too bad that they are a bit shimmery, which is weird for a concealer. But I know that makeup for ever is such a great brand with amazing products. I love their aqua lip liner. Very functional palette. I love the colors. This looks really interesting! I had never tried the brand before. this looks super cool. But i never know when or how to use each concealer color! i know that green is for redness... so these many concealers just confuse me xD I rather go for something simpler! I've not actually ever tried anything from this brand, I'm really intrigued by green colour correctors as I've never tried one before! I need to try this palette! Really need a palette like that! This type of palette are not always a great shop choice just because have tones that we don´t give much use. In general, is a great palette. Nice concealer palette - like the different shades it offers and I think for that it is probably worth the high price tag. Have a lovely weekend! It seems a cool palette! I love this product! My makeup artist friend have this and whenever he do my makeup he uses this palette. The green shade really covered my reddish skin from acne and I totally agree that it last long :) Great review!